In case you haven’t figured it out yet, when I suffer from writer’s block I go to wikipedia and see what exciting events or birthdays took place on a specific day. It’s been over a week since I’ve posted anything, so I thought I needed to contribute something to the internet conversation this week. Today is B.B. King‘s birthday. 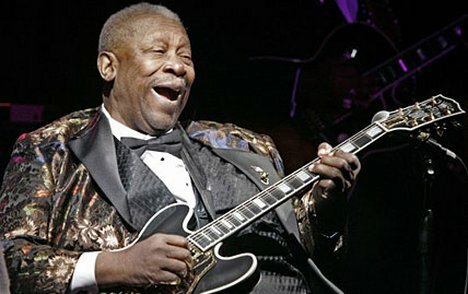 He is 86 today, and still rocking. And although he sings “The Thrill is Gone,” he is still giving thrilling performances. B.B. King is from Mississippi, but in my heart, he is from Memphis. Everyone in the Volunteer State associates B.B. with Memphis. His first records were produced by Sam Phillips (who discovered Elvis, Johnny Cash, and Jerry Lee Lewis in Memphis). There is just something Southern and classy about B.B. King. I can’t speak for what kind of person B.B. is. I don’t know what kind of rock star life he may have lived, but I know that he has made some great music, and he opened up the doors for a lot of great minority musicians. B.B. King is dynamic and fun. By all accounts, he seems to have a great personality. 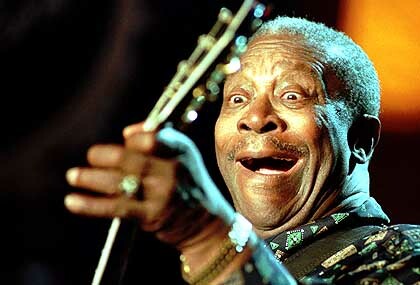 You may not like blues, but you gotta like BB. I love the fact that he dresses up for a performance. No T shirts and torn jeans for B.B. King!!!!!! He does always look classy. What a great pic at the end! The sign of a great performer is his ability to have fun while producing good soulful music on the stage. I love that he can just sit there and play and no one complains. He’s a great entertainer.